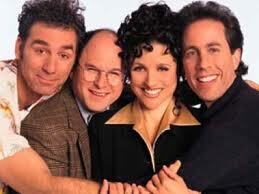 I love this story because it’s one of artistic integrity, something Seinfeld has staked his career on. Movies and reunions could have netted him more money throughout the years, but he (and co-creator Larry David) chose a perfect, hilarious, meta arc on Curb Your Enthusiasm and nothing else. Comedians in Cars Getting Coffee is stellar. (The Marriage Ref, less so, but none of us is perfect.) He believes in everything he puts his name on, and it shows. While I believe this, I also think it’s important to note that the man has gobs of money. Piles of money. Mountains of money. So much money. Last year alone, he made $32 million. And that’s just touring with his standup and doing a little web show. (Really, it’s syndication money from endless reruns of Seinfeld.) When he first decided to quit the show and word got out that he’d been offered $5 million, some uproar ensued. How greedy, how entitled, to turn down that kind of money! And to take our favorite show with it! Somehow the regular folk often forget that these amounts start to sound different to people who have millions. They have millions they can’t remember, millions they don’t know about. If someone stole a million or two from them, they may not even realize it. So $5 million? Eh, don’t really need it. Can’t you imagine that it almost starts to feel grosser, more entitled, to take such obscene amounts? Sure, you could accept it and then give it to a really worthy charity or something. But at some point — I presume — money must lose its meaning. While your brand name, your reputation, will always mean something. Once you’ve made your first several million, it’s worth investing a little capital in that. Maybe even well before then.